Royal Navy battleship HMS King George V on its journey from Scapa Flow to the United States in January 1941. 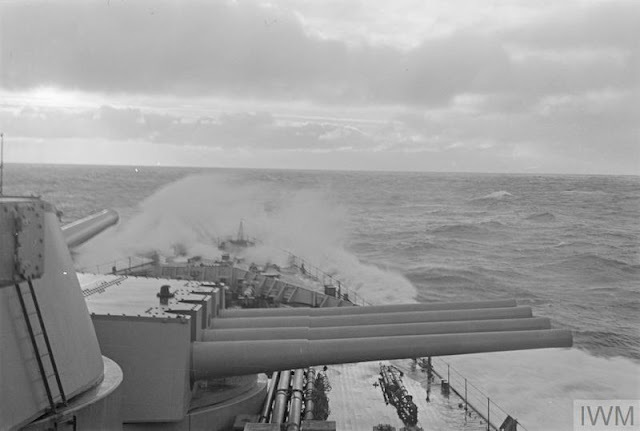 "A view of the fore guns of "A" turret with spray breaking over the fo'c'sle." © IWM (A 3017). Italian/Greek Campaign: The Greeks continue to consolidate their grip on the key Klisura Pass on 15 January 1941. The Italian forces have been badly mauled, especially the Lupi di Toscana Division, and many Italians have become POWs. However, both the remaining Italian forces and the weather are preventing the Greeks from exploiting this victory and marching on the strategic port of Valona. The RAF bombs Italian supply lines near Berat. Air Marshal Longmore joins General Archibald Wavell in Athens, where the two discuss reinforcing the Greeks with British forces. Greek Prime Minister Ioannis Metaxas requests equipment to help in Albania. Wavell offer the immediate transfer of a combined anti-aircraft and anti-tank regiment, but Metaxas refuses. Wavell argues that sending even a token British force will impress the Turks and Yugoslavs to stay out of the war, and even lead them to the Allied side. Metaxas, however, responds that such a small force "would provoke the Germans to attack." Metaxas only wants British troops on the mainland if they are able to act offensively as well as defensively, and until such time as such forces are available, the British should stay out. The heart of the issue is Greek mistrust of the British, who they feel are only trying to get Greece involved in the war against Germany. The British also mistrust the Greeks, who they feel will make a separate peace with Italy and leave the British troops with another front to defend in Greece/Albania. Wavell puts on a good show, but he (along with Longmore) already has indicated internally that he does not want to send British troops to the Greek mainland. 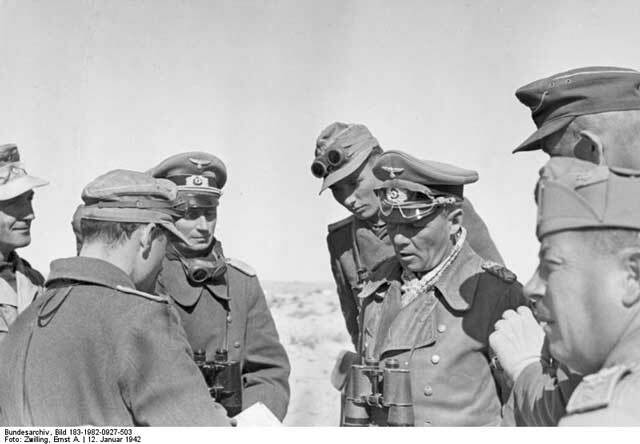 Metaxas, in a sense, is just playing into his hands and permitting the British offensive in North Africa to continue. However, truth is that the British simply do not have the troops to spare that Metaxas feels would justify a British ground presence in Greece. European Air Operations: RAF Bomber Command attacks Wilhelmshaven with 70-76 bombers out of 96 that set out. The 20 that fail to attack either get lost or turn back. At this stage of the war, that is considered a successful attack. Another, smaller force attacks Emden. The RAF lists new priorities for its bomber attacks. They are to be oil, industrial towns, and communications in that order. The order reads, "Oil considered the sole primary aim of our Bomber Offensive." Major targets are to include Bremen, Hanover, Magdeburg and Oppau, among others. The Luftwaffe sends 49 bombers against Derby during the night, and night fighters also attack RAF airfields in the north, including Church Fenton and Driffield. Action during the night is confused, and the darkness prevents British anti-aircraft from operating while RAF bombers are operating. The German night fighters get in some useful practice, tracking RAF bombers back to their bases after their missions and forcing down three of them. During this night action, Oblt. Egmont zur Lippe of 4./NJG 1 shoots down a Whitley bomber over Holland for his second victory claim. Oblt. Albert Schulz of 2./NJG 2 shoots down two Blenheims in fifteen minutes for his first two claims. It is dangerous work, however; another fighter pilot with six claims, Heinrich Kopperschläger of JG 53, perishes in a flying accident. Strong hurricane force winds sink three US Navy PBY Catalina flying boats of the US Navy squadron VP-73 and two PBM Mariner aircraft of VP-74 at Iceland. 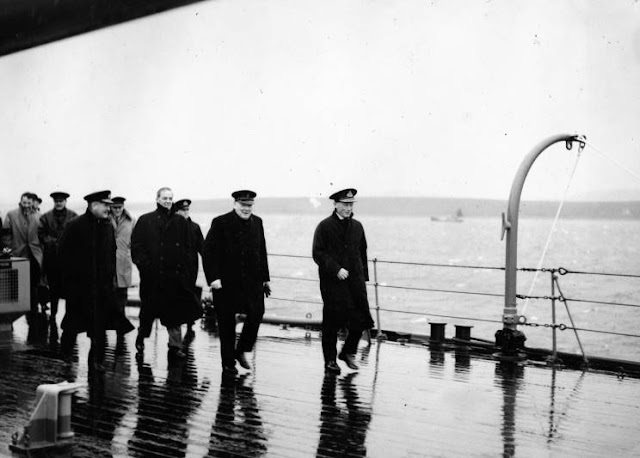 Prime Minister Winston S. Churchill, Commander-in-Chief Home Fleet Vice Admiral Sir John C. Tovey (right), and Vice Admiral Sir Bruce A Fraser (front left) aboard HMS King George V at Scapa Flow. January 15, 1941. Battle of the Atlantic: German raider Pinguin rounds up some more parts of the Norwegian whaling fleet, including 12,083 ton oil refinery tanker Pelagos and several whalers. Three whalers have escaped to the Falkland Islands, where they will report what happened. German tanker Nordmark, operating in the South Atlantic, rendezvouses with captured refrigerated ship Duquesna and replenishes its food stocks. The German sailors have grown to love the Duquesna, which they call a "floating delicatessen" full of frozen meat and dairy products. Italian submarine Torelli (Captain C.F. Primo Longobardo) is one of the most successful Italian submarines under its able commander. Operating in the mid-Atlantic west of Ireland, Torelli torpedoes and sinks 5198 ton Greek freighter Nemea and 4079 ton Norwegian freighter Brask. There are 17 deaths on the Nemea and a dozen on the Brask (20 survivors). The incident is a bit unusual because, after the survivors of the Nemea abandon ship, the survivors of the Brask board the abandoned Nemea. The Greek survivors of the Nemea then themselves re-board their own ship. However, soon everyone is out of luck, because the Nemea eventually sinks. Happily, the survivors are all rescued by HMS Highlander. The Torelli also torpedoes and sinks 3111 ton Greek freighter Nicolaos Filinis from the same group of about six ships that it originally spotted. This sinking either occurs on the 15th or the 16th, accounts differ. Three crewmen perish. British 1286 ton sludge ship Mancunium hits a mine and sinks off Liverpool in the Mersey. Everyone survives. Another freighter, 354 ton Karri, also hits a mine in the same vicinity but makes it to shore to be beached and later repaired. One man perishes on the Karri. British 1823 ton freighter Maywood hits a mine and is damaged in the Bristol Channel south of Cardiff. Several vessels have hit mines there recently. Maywood temporarily is beached at Whitmore Bay, then goes to Barry for repairs. The Luftwaffe bombs and damages British 197 ton freighter Stalker in Hawke Roads, Grimsby. It sinks, but is refloated and repaired. Royal Navy minelayer HMS Adventure hits a mine and is badly damaged. Convoys FS 388 and 389 depart from Methil, Convoy HX 103 departs from Halifax, Convoy BHX 103 departs from Bermuda. U-151 and U-554 are commissioned, U-179 is laid down. US destroyer USS Gwin is commissioned. Royal Navy minesweeper HMS Felixstowe and minesweeping trawler HMS Hoxa launched, corvettes HMS Godetia and Anchusa are laid down and launched, respectively. 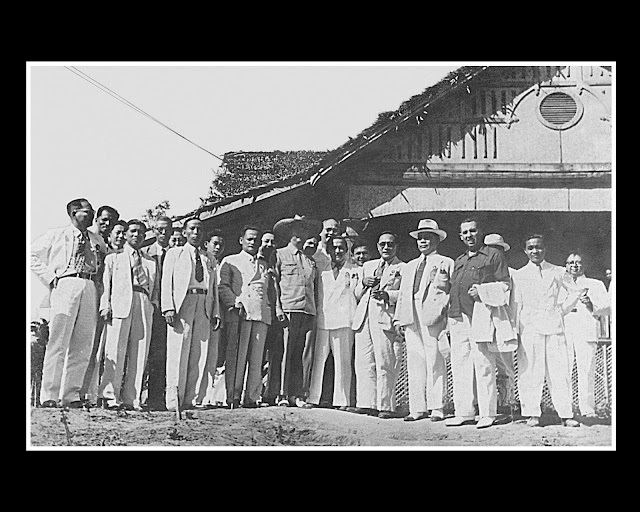 An inauguration ceremony for local officials in Tagkawayan, Quezon, Philippines on 15 January 1941. Visible is Benigno Aquino Sr., whose grandson, Benigno S. Aquino III, will become the 15th President of the Philippines from 2010 to 2016 (Tripod). Battle of the Mediterranean: The Australian and British troops earmarked for the assault on Tobruk in under a week's time continue their preparations. The British 7th Armoured Division is getting its tanks repaired, while the Australian infantry works on the tactics that it successfully employed at Bardia. Royal Navy submarine HMS Regent torpedoes and sinks 2472 ton Italian freighter Citta di Messina off Benghazi. Vice Admiral Andrew Cunningham, already commander-in-chief of the Mediterranean Fleet, is promoted to the rank of full Admiral. Cunningham was before a board of enquiry only a few months ago, so this is a vote of confidence in him by the Admiralty. At Malta, a Luftwaffe plane bearing a red cross in a white circle - an internationally recognized symbol for rescue operations that are immune from attack - is spotted at high altitude over eastern Malta. While the RAF does not get airborne in time to shoot it down, use of this symbol is considered by the RAF to be a ruse. The RAF is notorious for shooting down such planes over the English Channel, which, if they actually are search and rescue planes, is a war crime. However, the British view these planes as performing reconnaissance, particularly since they appear at times when no rescue is needed and fly at altitudes used by reconnaissance planes, not search and rescue missions. This is another sign that the fierce contest of over the Channel is heading down to Malta as well, with the Germans and British gearing up for similar heated warfare. The Axis planes also stage a couple of air raids over Malta, but foul weather prevents them from releasing any bombs of consequence. RAF reconnaissance over Catania, Sicily shows that the results of the 13 January British air raid were quite good, with 25 Axis planes destroyed or badly damaged and hangars badly damaged. Japanese Military: The Japanese Navy forms the 11th Air Fleet under Vice Admiral Eikichi Katagiri, commander, and Rear Admiral Takijiro Onishi, chief of staff. Italian Somaliland: British forces mount major attacks on Italian positions from Sudan and Kenya. HRH Haile Selassie during his return trip to Ethiopia, January 1941. With him are two heavily armed bodyguards and a priest. Abyssinia: His Royal Highness Haile Selassie, deposed (and future) Emperor of Abyssinia (Ethiopia), returns to his country for the first time since May 1936 with British assistance. He is one of several claimants to thrones or exiled nationalist figures that the British have chosen to support for their own purposes, Charles de Gaulle being a famous example. Other claimants have not proven so fortunate, such as exiled King Zog of Albania, but Selassie inspires fervent devotion in his followers. The British hope that Selassie will spark an uprising and, should the Italians be chased out his country, govern with policies favorable to them. Selassie is accompanied by his two sons and a retinue. Italy is cornered by the grip of Great Britain by sea, air and land power. The Italians will not escape my trusted warriors. Selassie not just is popular in his own country; many - the Rastafarians - actually consider him to be a living god. 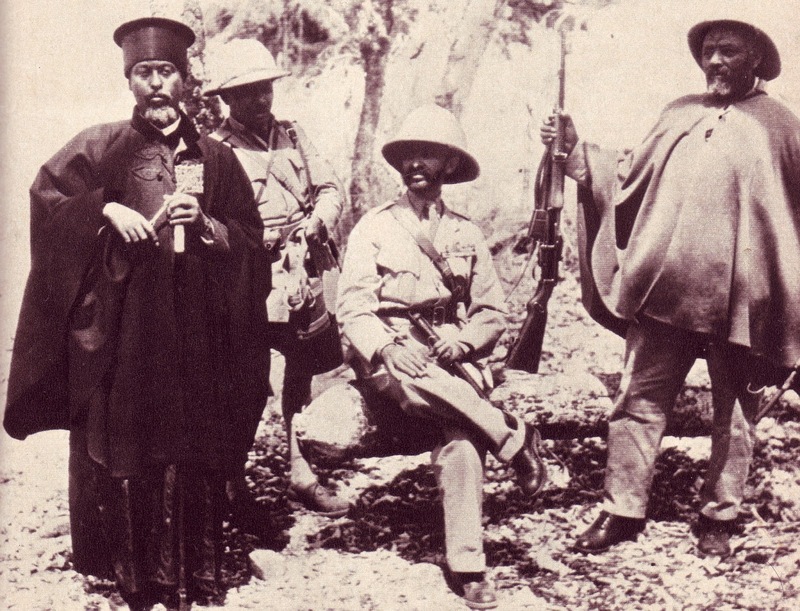 Selassie's return is a harbinger of increased British attacks to wrest the entire region from Italian hegemony. There are reports of uprisings upon his return. Haile Selassie, despite being from an impoverished third world nation, is one of the enduring figures of 20th Century politics and this is his most stressful period. Indochina: The Thai army pushes back Vichy French troops near Pakse and in the Sisophon area. French naval units in the area form up and head out toward the Thai-Cambodian border around 21:15. China: The Nationalist Chinese (Kuomintang) government completes the destruction of the surrounded Communist Chinese New Fourth Army. The Nationalists demand that the remainder of the New Fourth Army be disbanded. The Communists, on the other hand, decry the entire Nationalist attack as a plot to destroy internal opposition and help the invading Japanese. Chairman Mao tells his troops not to trust the Nationalist Chinese. British Homefront: King George and Prime Minister Churchill travel to Scapa Flow to see off Lord Halifax for his voyage to Washington as the new British ambassador. After lunch, battleship King George V departs for the US carrying Ambassador Lord Halifax, escorted by four destroyers, in Operation Parcel. Separately, Sir Gerald Campbell, British High Commissioner to Canada, is transferred to Washington to become British Consul General to the United States. American Homefront: RKO Pictures studio head George J. Schaefer has his lawyers study the issue of whether or not to release Orson Welles' forthcoming motion picture, "Citizen Kane." Schaefer believes strongly in Welles and the picture, but wants to make sure that there are no legal issues involved in releasing it. The RKO lawyers review the film and ask Welles to cut three minutes of its running time to satisfy their concerns about a possible defamation action by William Randolph Hearst. Welles complies. Future History: Don Glen Vliet is born in Glendale, California. 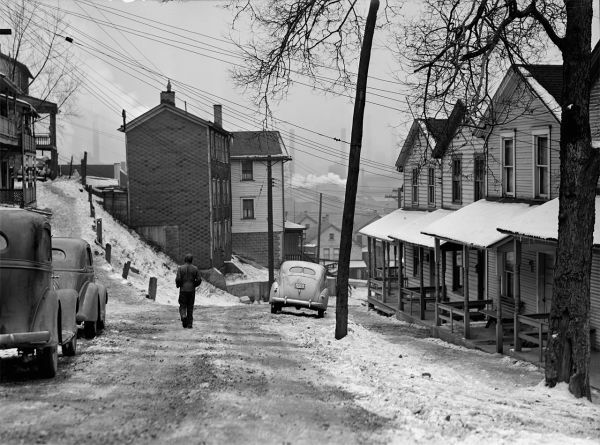 Vliet shows artistic inclinations at an early age, and attends high school with Frank Zappa. While Don later is full of fanciful tales about his early days, some of which appear somewhat suspect, it is clear that he is extremely talented in multiple fields - perhaps not quite so much as he claims, but who knows - but drops out of high school to help support his family. Don and Zappa begin collaborating on music, and at some point he and Zappa decide to rename Don "Captain Beefheart" (something that Don later asks Rolling Stone "don't ask me why or how"). Anyway, as Captain Beefheart, he begins recording in the early 1960s, and gains as admirers none other than John Lennon and Paul McCartney, though it is unclear if the two Beatles ever actually met Don (he claims to have met McCartney, who has no recollection of this). Captain Beefheart goes on to become a legend in the avant garde music, one of the true characters of the rock scene, and passes away in 2010. 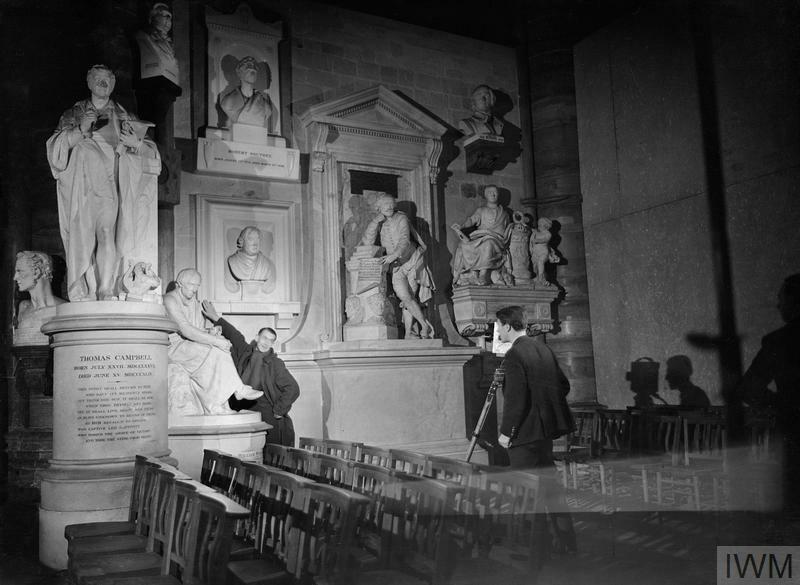 "Director Humphrey Jennings (left) stretches up to touch a piece of sculpture in Poets' Corner, as he suggests a shot for Camera Operator Chick Fowle of the Crown Film Unit, probably during the filming of 'Words For Battle' in Westminster Abbey, 1941." This was taken during January 1941. © IWM (D 1861).